As each year comes to a close, I like to remember back on my favorite bird sightings of the year. OK, 2012 isn't officially over, so here's hoping that another couple of good birds show up to play havoc with this list :-) In the meantime, here are my personal best birds seen or heard in 2012. 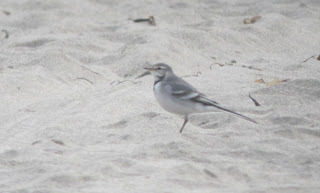 1) White Wagtail. I was fortunate enough to be out in Orange County, California when this bird show up on a beach in San Pedro south of LA earlier this month. I chased it the next day and it was a new ABA Area bird for me, and I was happy to see it with an old birding friend Rob Bates from Austin that I ran into unexpectedly on the beach.We watched it fly up and down the beach and wag its tail a bunch of times, and I managed a couple of digiscoped shots. 2) Barolo Shearwater. A life bird for me this year, I was fortunate enough to be able to accompany my Montana birding buddy Mike Schwitters on the Brookline Bird Club pelagic trip out of Massachusetts that netted us a sighting of this bird. It was a great new bird for me, and ABA area bird #800 for my buddy Mike. Sweet! (Post about this trip here, and checklists from this trip here). 3) White-faced Storm Petrel. Another new ABA Area bird for me this year on the Brookline Bird Club pelagic trip. I was able to see hundreds of these little cuties down in New Zealand last year, but it was great to see them off the Atlantic coast of North America. 4) Red-billed Tropicbird. A new bird for my ABA and life list, see on that Brookline Bird Club trip--Even though my seasickness patches ultimately didn't keep me from getting sick on that trip, I'm really glad I was able to be on that trip and see these cool birds. 5) Dovekie. This one was seen on a pelagic trip out of Cape May, NJ last February. This was a new ABA area and life bird for me, and the Razorbills on that trip were also new ABA area birds for me. It was a long cold trip, but no seasickness, so that was a super plus. 6) Eared Grebe. I spent a lot of time this year getting to know the birding locations and birds in my new county after moving to Hunterdon County, NJ last fall. 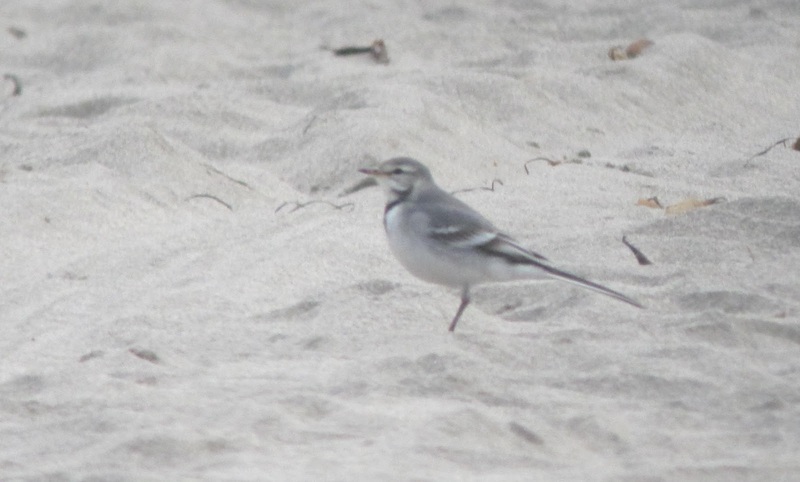 This bird is a state-wide rarity in New Jersey, and the first rare bird that I found in the county this year. It appears to have been the only Eared Grebe found in New Jersey in 2012. So, sorry for the crappy digiscoped photos, but it was a very foggy day and blah, blah, blah. Best thing that came out of this sighting was my decision to finally get a better spotting scope--and I've enjoyed my Kowa 883 ever since! 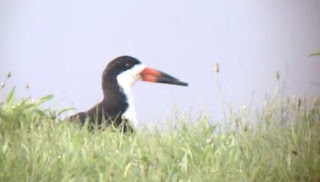 7) Black Skimmer. Another county rarity that I found, apparently only a second county record, and the first one of the eBird era :-) Even though these birds every day of the year only an hour from here, they don't usually show up inland. It stuck around for a couple of days and all the county listers were able to get good looks as it hung out near a boat launch at the local reservoir. Sometimes you get credit for finding tough to ID rarities, but this one is as easy to ID as they come. 8) Royal Tern. When Hurricane Sandy blew through, we had a great day at the local reservoirs. This was my contribution--two birds that I found at Round Valley Reservoir after the storm. Apparently a first Hunterdon County record. Here's an eBird checklist with my friend Michael Rehman's photo of one of the birds. Other great local rarities that I was able to see that day were a Leach's Storm Petrel (county first), American Oystercatchers (county first), Pomarine Jaeger, and Red Phalarope. 10) Common Chaffinch. Another controversial bird. Ultimately rejected as a possible escapee by the New Jersey Bird Records Committee, this bird entertained hundreds of birders at my friend Michael Rehman's feeders just five minutes from my house. It was a great way to start off the year seeing this bird and all my friends who came over to see it (blog post and fuzzy photos here). Local county rarities Pink-footed Goose (2nd NJ and 1st Hunterdon County record, how does this not make the top 10?!? ), Ross's Goose, Cave Swallow, Little Gull, Clay-colored Sparrow in the yard (I could do a whole best yard birds of the year post! Update: Here it is! ), Evening Grosbeak, Common Redpoll, Red Crossbill, and White-winged Crossbill. New ABA bird (if it is ever accepted on the official list)--Nutmeg Mannakin on my Orange County trip. Thanks to everyone who I was able to bird with or who helped me find birds this past year! It was a lot of fun. Sticking mostly to my own county, I still managed to see 371 bird species in 12 states this year. Closer to home, unless the snow stops and I can get lucky with a last minute rarity or a Long-eared Owl, looks like I will end up with 254 (or 252, see above) species for Hunterdon County this year. It was a great year of birding in the county, with the previous county year record of 257 broken and 3 birders finishing with 250+ county birds for the year and 6 local birders with 220+ species. Before we look forward to a great year of birding in 2013, what were your own best birds of 2012? Sounds like 2012 was a great year for birding. Your top five are birds I have yet to see. I hope 2013 is even better!